of OD Fort Allahabad. The candidates who are having interest they can apply for this Tradesman Mate, Fireman, LDC posts through a specific format and filled application to be reach to The Commandant, Ordnance Depot Fort Allahabad within 21 days from the notification date. 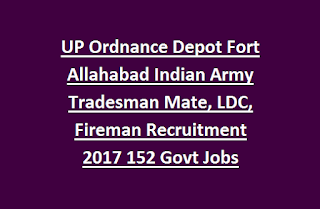 For more information regarding this Ordnance Depot Fort Allahabad TMM, LDC jobs recruitment please see the below mentioned details. 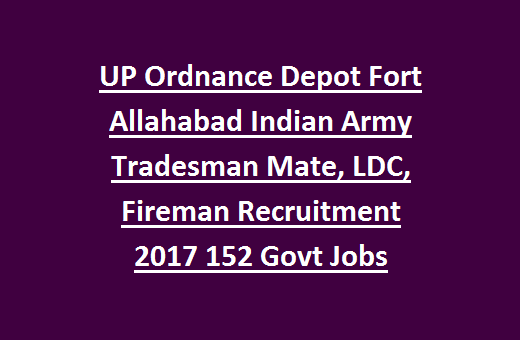 There total 152 vacancies available in this OD Fort Allahabad Recruitment. For LDC, Fireman posts matriculation is required. For Tradesman Mate Matriculation or ITI is required. OD Fort Recruitment will be held in two stages. Physical Measurements test and written test will be conducted. Depends upon the requirement Trade test also conducted. (i) Carrying a man/weight ( Fireman lift ) of 63.5 Kgs weight to a distance of 183 meter within 96 secs. (iii) Climbing 3 meter vertical rope using hands and feet. (i) 1.5 KM run in 6 Minutes. (ii) Carrying a weight 50 Kg to a distance of 200 Mtr in 100 Sec. Those who are qualified Physical Endurance tests, they are eligible to attend the written test. Interested candidates can apply through the prescribed application. After filling the form neatly attach the educational qualifications and other required documents and send to the respective Indian army recruitment centers of Central Ordnance Depot, Kanpur. For more details please see the official notification or (29 April 2017 to 05 May 2017 Employment News) information. Self addressed envelope affixing postal Stamp of `. 25/-. to be attached with the application form. Click here to see the official notification instructions..
https://indianarmy.nic.in/writereaddata/documents/OD%20FORT%20ALD%20%20English%20.pdfNote: Before sending application please refer the notification given in Employment news edition for the week 29 April 2017 to 05 May 2017.